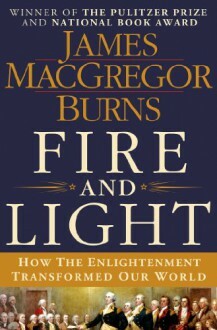 “James MacGregor Burns is a national treasure, and Fire and Light is the elegiac capstone to a career devoted to understanding the seminal ideas that made America - for better and for worse - what it is.” --Joseph J. Ellis, Pulitzer Prize and National Book Award winning author Revolutionary Summer Pulitzer Prize–winning and bestselling historian James Burns explores the most daring and productive intellectual movement in history, the European and American EnlightenmentIn this engaging history, James Burns brings to vivid life the two-hundred-year conflagration of the Enlightenment, during which audacious questions and astonishing ideas tore across Europe and the New World, transforming thought, bringing down governments, and inspiring visionary political experiments that would ultimately reach every corner of the globe. Unlike most historians, Burns pays particular attention to America’s intellectual revolution, beginning and ending his story on American soil. He discovers the origins of our domestic Enlightenment in men like Benjamin Franklin, John Adams, and Thomas Jefferson and their early encounters with incendiary European ideas about liberty and equality, and he highlights the role of thinkers like James Madison and Alexander Hamilton. After all, it was the American founders, alone among Enlightenment thinkers, who actually carried through with their ideas.Today the same questions Enlightenment thinkers grappled with have taken on new urgency around the world: in the blossoming Arab Spring, in the former Soviet Union, China, and in the United States. What should a nation be? What should a citizenry expect from its government? Who should lead and decide? How can citizens effect change? What is happiness, and what can the state contribute to it? Burns's exploration of the ideals and arguments that formed the bedrock of our nation, shines a new light on these ever-important questions.